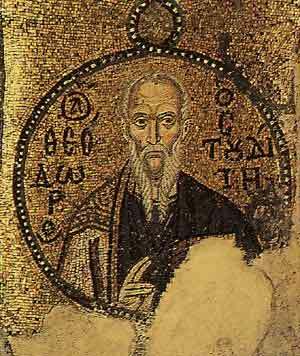 St Theodore of Studion: 11th-century mosaic from Nea Moni Monastery, Chios. Theodore the Studite, also called St Theodore of Studion or St Theodore of Studium ( ca. 758 - ca. 826 ), was a Christian monk widely known for his zealous opposition to iconoclasm, for his personal asceticism and monastic rule, and for the many liturgies he composed, particularly the Lenten Triodion which is still widely used in Eastern Orthodoxy. Theodore was born in Constantinople, and argued bravely in defense of icons in the capital of the Byzantine Empire during the emperor's opposition. In 794 he succeeded his uncle Plato, who had persuaded him to become a monk some ten years before, as head of the monastery of Saccudion in Bithynia. 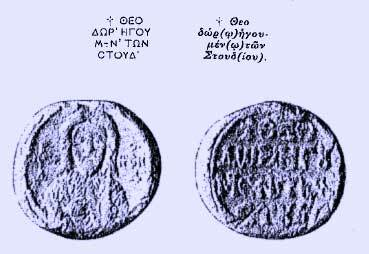 Soon afterwards he was banished to Thessalonica for having excommunicated Constantine VI, who had divorced his wife Maria in order to marry Theodote. After the emperor's death in 797 he was recalled with every mark of favor, and moved back with his monks to the great monastery of Studion in Constantinople, where he carried on a vigorous campaign in favor of asceticism and monastic reform. He famously allowed his monks to sprinkle nutmeg (an expensive spice at the time) on their pease pudding when they were required to eat it. In 809 he was again banished in consequence of his refusal to hold communion with the patriarch Nicephorus, who had pardoned the priest Joseph for his part in the marriage of Constantine and Theodote. In 811 he was recalled by Michael Rhangabes, and again banished and flogged in 814 for his resistance to the edict of Leo the Armenian, which forbade the worship of images. Liberated in 821 by the Emperor Michael II, he soon got into trouble again. In 824 he violently attacked Michael for showing too great leniency towards the iconoclasts and even favored an insurrection against him. When the attempt failed, Theodorus found it prudent to leave Constantinople. He lived at various monasteries in Bithynia, on Chalcitis and on the peninsula of Tryphon, near the promontory of Acrita, where he died on the November 11, 826. He was buried at Chalcitis, but his body was moved to Studion at January 26, 844. He subsequently received the honors of canonization. His feast day is November 11. Various polemical discourses connected with the question of image-worship. He was also the author of epigrams on various subjects, which show considerable originality, and of some church hymns. Like all the monks of Studion, Theodore was famous for his calligraphy and industry in copying manuscripts. This article incorporates text from the Encyclopædia Britannica Eleventh Edition, a publication in the public domain.